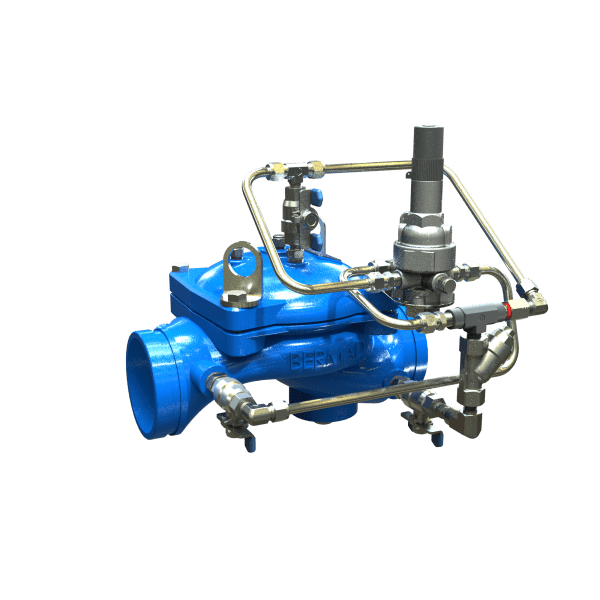 Pressure relief/sustaining hydraulically operated control valve that can fulfill either of two separate functions: When installed in-line, it sustains minimum pre-set, upstream (back) pressure regardless of fluctuating flow or varying downstream pressure. When installed as a “branched from the line” circulation valve it relieves excessive line pressure when above maximum pre-set. 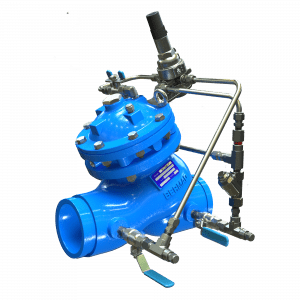 BERMAD 400 series valves are hydraulically operated, simple and reliable, globe valves with full bore hydrodynamic body providing an unobstructed flow path and superior performance. The valves balanced rolling-diaphragm assembly is vulcanized with a rugged radial seal disk construction, performing as the valves only moving part. The BERMAD BC-430-P As a pressure sustaining valve that recycles water back to the reservoir at stagnate pump operation, it will remain close when raiser pressure is normal. In an event where the pump works at low flows and high head, the BC-430-P will open to allow sufficient water circulation and pump cooling. Also featured is the BC-740-P Active-Check Valve that coordinates start / stop functions simultaneously with the pump controller.